As a human fetus develops, its heart has to keep pace with the new body's ever-growing demands. Much of this is controlled by following genetic blueprints, but the embryonic heart also matures in response to the intense stresses of pumping blood. 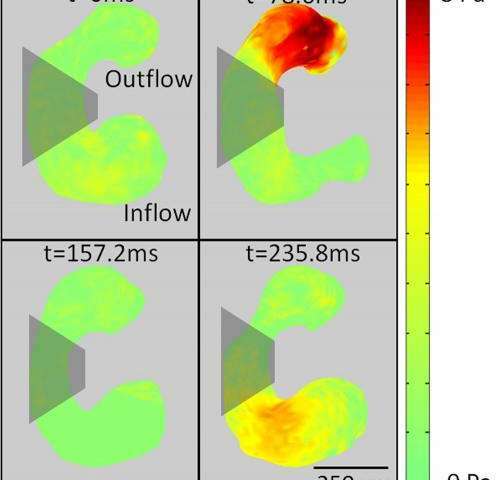 For the first time, researchers have been able to visualize in 3-D the stresses induced by flowing blood in an embryonic heart. The technique, which promises to provide new insight into how and why heart defects develop, is described in a paper published today in the Optical Society's (OSA) open-access journal Biomedical Optics Express. The researchers, led by Andrew M. Rollins, an associate professor of biomedical engineering at Case Western Reserve University in Cleveland, looked at a particular type of stress in the heart known as shear stress, which is simply the parallel force of one material sliding along another. In the developing heart, shear stress is induced in the heart's own endocardial cells as blood cells rush past them. Normally, such shear stress helps to control and regulate cellular processes involved in heart development. Even tiny aberrations in the heart beat, however, can alter blood flow patterns and change these developmental forces, leading to congenital heart defects such as abnormal valve formation. 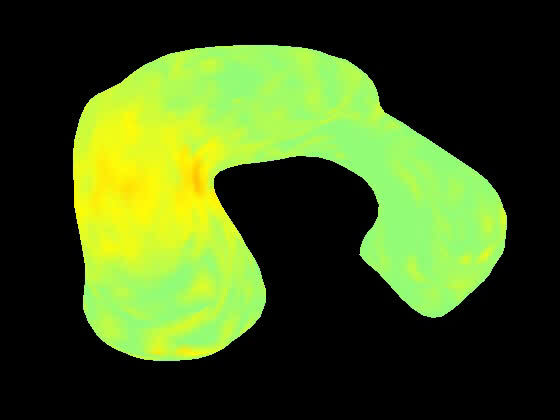 "All previous attempts at shear-stress mapping have been two dimensional, but the 3-D geometry of the embryonic heart is changing hour by hour at these early stages, and the shape of the heart twists and turns as it develops," says Rollins, "so a 2-D projection doesn't really provide a good approximation." Rollins and his colleagues at Case Western Reserve developed their new imaging method by modifying a technique called Doppler optical coherence tomography, or OCT. In OCT, a beam of infrared light is shined on a tissue and the "echoes" (or reflections) of that light produced at varying depths are used to make an image. "It is just like RADAR or ultrasound," Rollins explains, "except we use infrared light and we image tiny things at really high resolution." The technique has been used to image the interior of blood vessels and is routinely used by ophthalmologists to examine the retina. "We can use this technique to figure out just how function or dysfunction fits into normal heart development and the development of heart defects," Rollins adds. "An understanding of normal and abnormal development is critical for preventing and treating these defects." 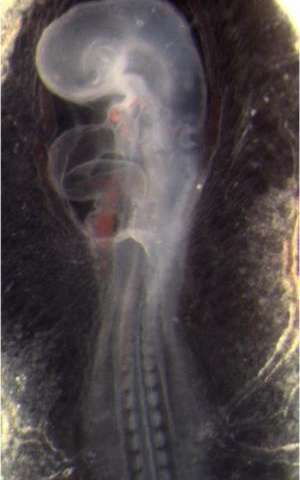 In laboratory experiments, Rollins and colleagues directly measured the heart structure and blood flow within the developing hearts of quail embryos. The data was then used to create 4-D images (basically, 3-D movies), which showed that "locations of high shear correspond with locations of future valve formation," he says. "Now we are investigating the effects of abnormal shear caused by alcohol exposure on valve development." The researchers hope to take what they have learned from these preliminary animal tests and develop a way to apply this technique to humans. The ultimate goal is to develop a tool that doctors can use to decide if early intervention could put a developing heart back on the right track, preventing a defect. More information: "4-D shear stress maps of the developing heart using Doppler optical coherence tomography," Biomedical Optics Express, Vol. 3, Issue 11, pp. 3022-3032 (2012).